All dumbbells are adjustable by changing weights. Some are easy to adjust quickly, some are time consuming to adjust. Your standard dumbbell requires you to remove the old pounds by taking off the spin on collar then pulling the old off, then sliding on the new and reattaching the spin on collar. Change both ends if you are using two dumbbells, then it takes that much longer. If you are trying to do quick reps with different weight sizes, the cool down period is much longer. What if you could do this quickly? There are two other types of adjustable dumbbells that need mentioning. The pin/tool type is fast. Your weights are on a rack with a bar; you slide the pin or move the tool over the pounds that you need. Lift up on the bar, the desired weights will attach. No taking off or putting on weights, just simply moving the pin and lift. There is a pin on each side of the bar so you must do two minor adjustments. Fast, simple, and no lost time between sets. But, there is a third type which is a dial. You select the weight desired, turn the knob, the weight is already on the bar. Many sets come with two knobs, but some come with one knob that changes both sides at once. 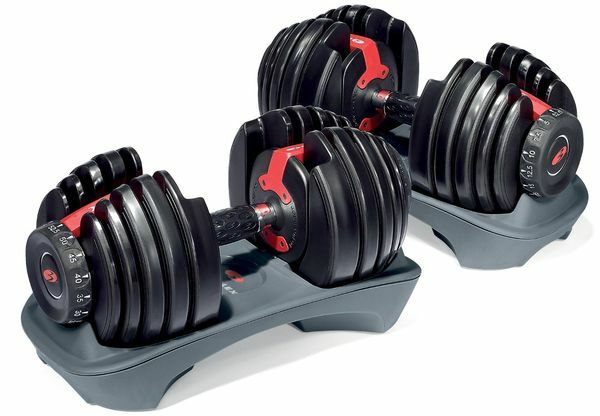 The Universal PowerPak 445 Adjustable Dumbbells come with just one dial. A flick of the wrist and you are ready to go with the next weight exercise. The classic dumbbells are still a good low end piece of equipment, and you will get plenty of workouts the same as the others, but it would be nice not to go to all the trouble of changing everything, when you can do it quickly. They are compact and completely mobile. Store them in your closet in as much room as a standard shoe rack. Many of us have had the home gyms espoused by TV infomercials, they seem to sit there after we have lost interest. These are sometimes so big that they cannot fit in a closet and soon become clothes racks. Finally, the wife wants it outside in the garage, where it sits forever, always with the idea that you will use it again. Many of the sets come with low pounds for the first 25lbs. Some with increments of 2.5lbs up to the 25lb mark where they become 5lb. increments. The lower increments are especially useful when beginning an exercise program. Start out with small increments and work your way up gradually. It is great for younger people and older people who want to get in shape without killing themselves. Toning muscles is very beneficial rather than bulking up. Many of us would rather tone up and feel good about ourselves. But the higher pounds are good for the experienced enthusiast, and many sets have options for even greater pounds but at additional costs. Many health benefits for all ages result from a weight lifting program. A very good cardiovascular workout routine, in fact, it has been proven that a weight lifting program using lower weights with more reps is superior than using the heavier weights. Too often we equate heavier lifting with better exercise and sometimes we assume since we cannot handle the heavier weights that we have gone as far as we can. It’s not true, and we should strive to maintain our exercising. Weight lifting also promotes muscle mass and bone density which aids everyone as we approach older age. Stronger bones in senior citizens are an asset that keeps on giving as we grow older. Keeping your muscles toned is another great asset. Look at the exercises at senior centers that promote muscles and bone density. Even though dumbbells are a good exercise regimen don’t forget that walking, running, and bicycling will also give a good cardiovascular workout. A well rounded program is good for everyone. Exercise anywhere with these. Move them to a different room, use them on the patio, or wherever you want. Take them on vacation with you as they take up little room. Unfortunately taking them on an airplane would be a costly venture, but you get the idea. We have talked about the different types and the advantages of each type, so now we need to decide on what to buy. Naturally the price is always a factor and the standard dumbbell set is the cheapest way to go. The pin and the dial are much more and can be two to three times the price of a basic set. But there a deals all the time on line, and you could save quite a bit by shopping around. Only buy when you get shipping for free as it is quite expensive otherwise.